Most people who have tried to do something new in the social sphere – in other words, social innovators – find that there is a roller coaster ride you must take to accomplish your goal (or not) that produces thrills and spills and moments of deep exhilaration and despair. 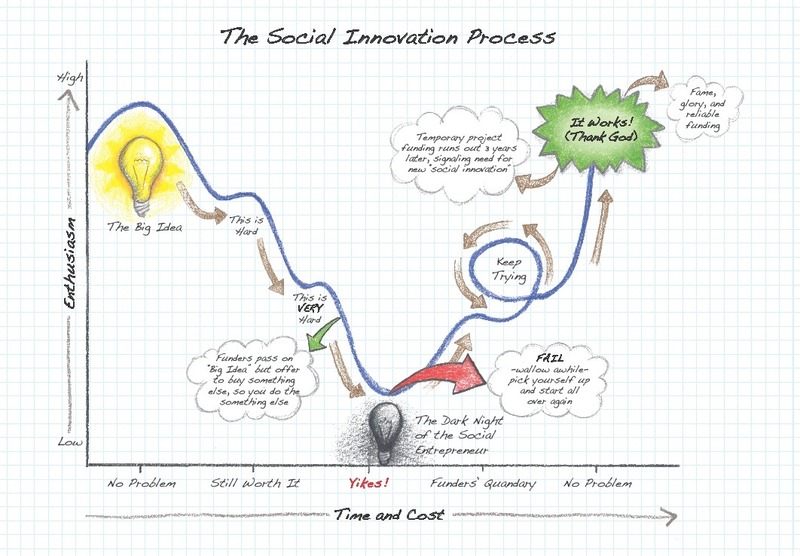 David Brown sent us this diagram mapping the social innovation process that resonated in all its drama with us. Please feel free to share it! Created by David Brown, of Brown Performance Group, with Jon Pratt and Ruth McCambridge. Illustrated by Jim Atherton. Brown specializes in working with nonprofit executives and boards to enhance organizational effectiveness through strategic thinking, business planning, and improved governance.